If there’s one time when Nick and I are bound to argue, it’s when we are in a kayak. We’ve paddled around Indonesia’s lakes in a dugout canoe, and argued about the fact that we were going in circles instead of a straight line. 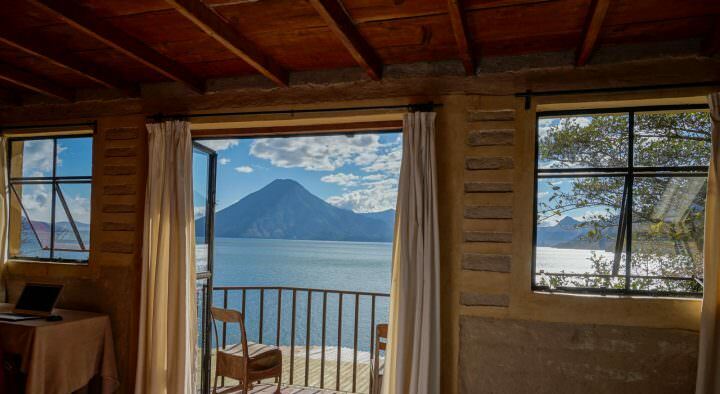 We kayaked daily on Lake Atitlan in Guatemala, with me getting annoyed at the fact that Nick always wanted to jump out of the kayak…while practically tipping it over while trying to get back in. 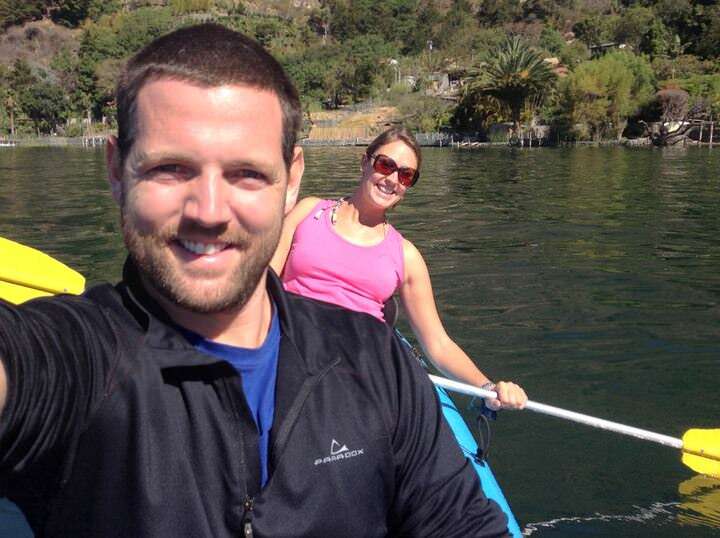 We paddled from Cape Maclear on Lake Malawi to a (very far away) offshore island. You guessed it, we argued about the danger aspect of our return journey, and the fact that we were both so exhausted that we barely made it to shore! Even though we’re almost sure to get on each other’s nerves, we still enjoy kayaking. 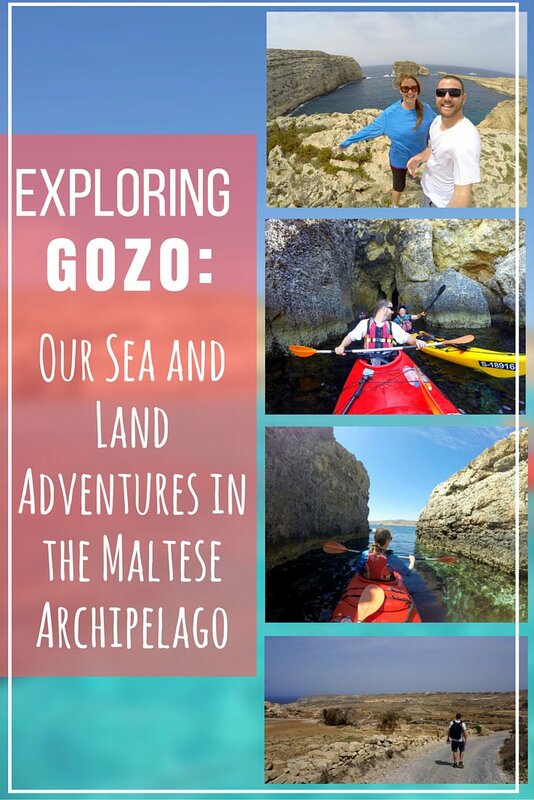 We chose to go with Gozo Adventures for our 14 kilometer trip from Gozo Island to Comino Island, and back. We were given a briefing from our guide, Sandra, before getting suited up at the harbour, and sliding into our bright red, double kayak. Nick and our guide, Sandra exploring a cave! Joining us on this amazing day trip was a guy from Canada and a couple from Germany, all of whom were our age. About 5 minutes into our great adventure, we saw a boat on fire! Smoke was billowing out from the engine room, the passengers were blowing the horn and waving their arms at boats that were passing by. We could not believe it. So, it was up to our little group of kayakers to save the day. Sandra took action and called through to an onshore rescue team on her phone. We waited for them to arrive in case the passengers needed to abandon ship. Within minutes the rescue boat pulled up to help out. 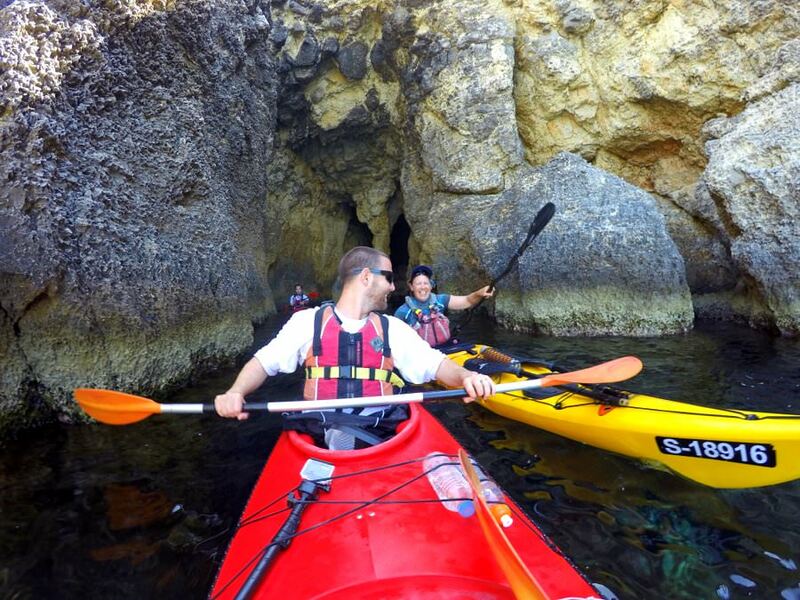 We took off paddling, and passed by incredible limestone rock formations, hidden caves and secret beaches. 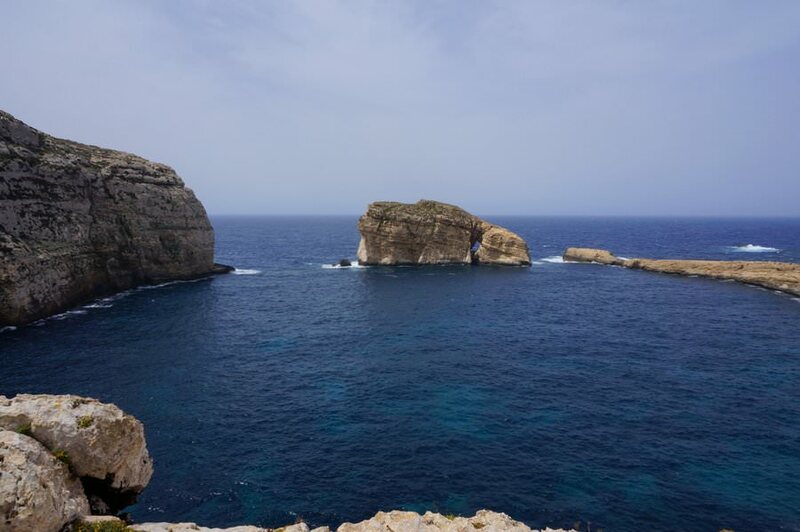 We crossed the channel from Gozo to Comino, and rather than just popping in to the famous Blue Lagoon, Sandra took us further along the northeast coast to some of her favourite spots. It was like a cave treasure hunt! Sandra would paddle faster ahead of us to see if the mouths of the caves were safe enough for us to enter, but if the waves were too big, she would return with a thumb’s down sign. Luckily, we were able to actually penetrate many of the towering caverns. The colourful coral below our boat was incredible and the jagged stalagmites and stalactites were beautiful. 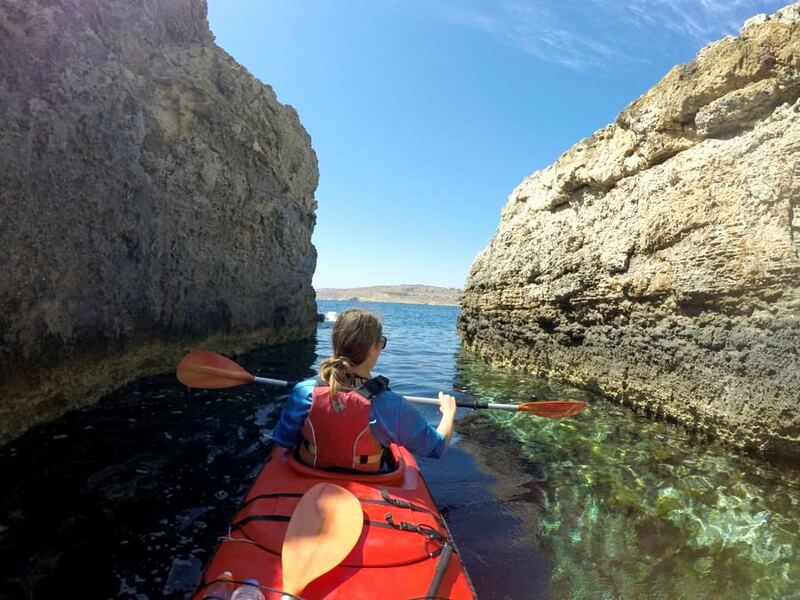 Trying to squeeze through narrow passages between two rocks, before popping out the other side in the sea was something we had never experienced before. 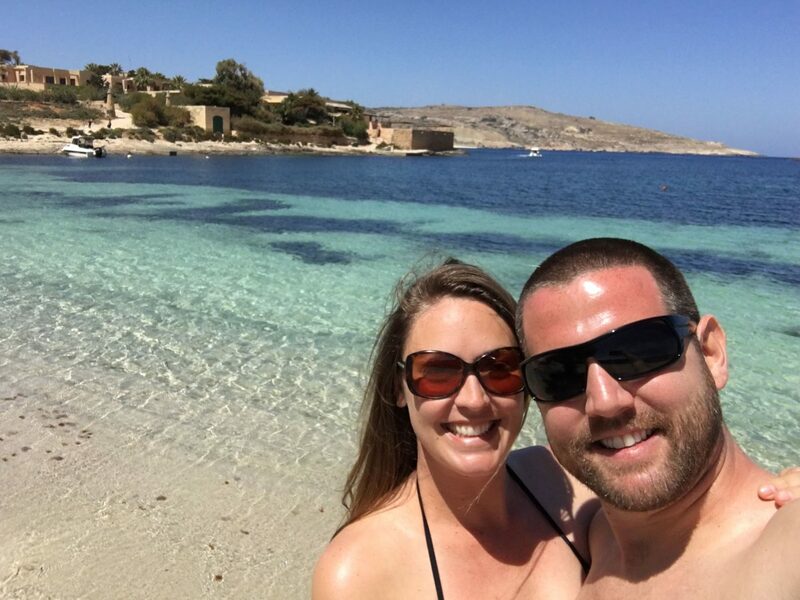 About halfway through our paddling trip, we stopped off at the gorgeous Santa Maria beach on Comino Island. The sand was white and the water was crystal clear. The only problem was that we were there during the jellyfish season. Needless to say, we didn’t swim, just relaxed and enjoyed some lunch. The star of the day was the aptly named Blue Lagoon. From the royal blue, open sea, we rounded a bend into the bay. The sea morphed from a deep blue to a bright turquoise colour – it felt as though we were in the Caribbean. We bobbed in our kayaks in awe for a few minutes. We were surrounded by dry and desolate land, with an ancient watch tower dominating the rocky hillside. After soaking in the moment, we continued on to yet another secret bay, before crossing the somewhat wavy sea back to the Mgarr Harbour. Look at the colour of that water! 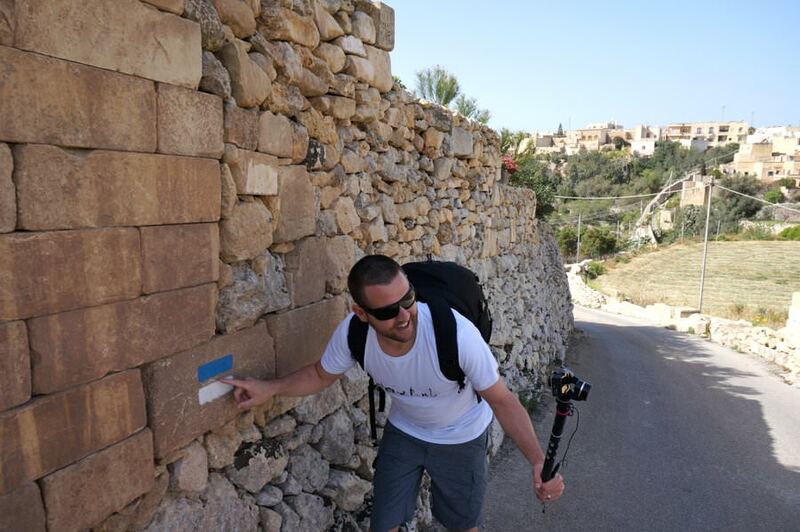 But, there was no time to bathe in a hot bath to ease our muscles, we wanted to do an independent hike around Gozo. We had seen the sea, now it was time to explore the land. 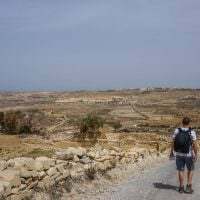 A huge bonus of hiking and travelling around Malta and Gozo is that you can do it all independent of a guide, if you want. 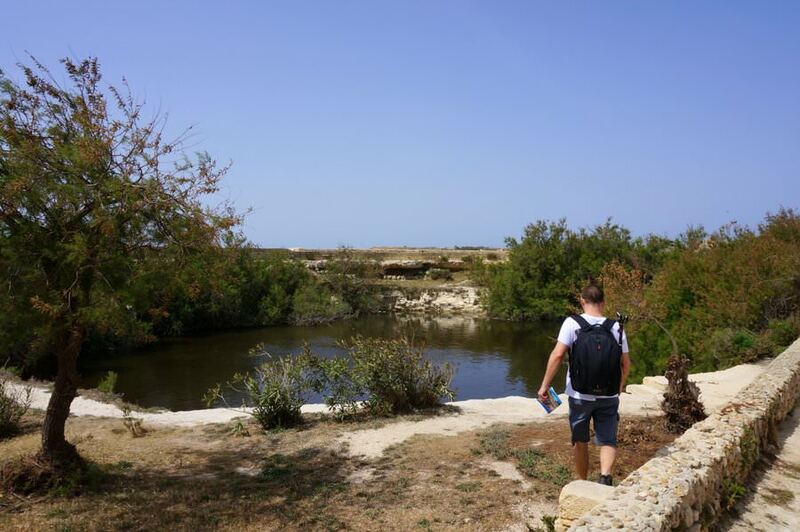 Visit Gozo in collaboration with The Rural Development Program for Malta have put together booklets on various walks around the island. The different routes are colour-coded and you just keep your eye out for the coloured markings to make sure you’re on the right trail. Now, if you know anything about the two of us, you’ll know that we have a horrible sense of direction. 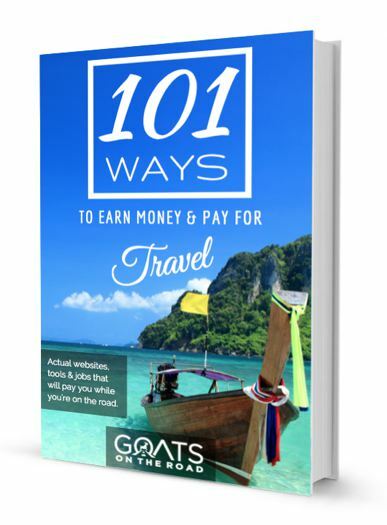 The fact that we can actually travel around the world is a complete miracle. Maybe there’s something special about Gozo? We managed to kayak without arguing and we hiked without getting lost! We decided on the Dwejra walk, which commenced at the gorgeous St. George Basilica in the city of Victoria. But, we weren’t in the city for long, which was exactly what we were hoping for. The trail and coloured markings brought us to a lush farm, complete with a little river running through it. 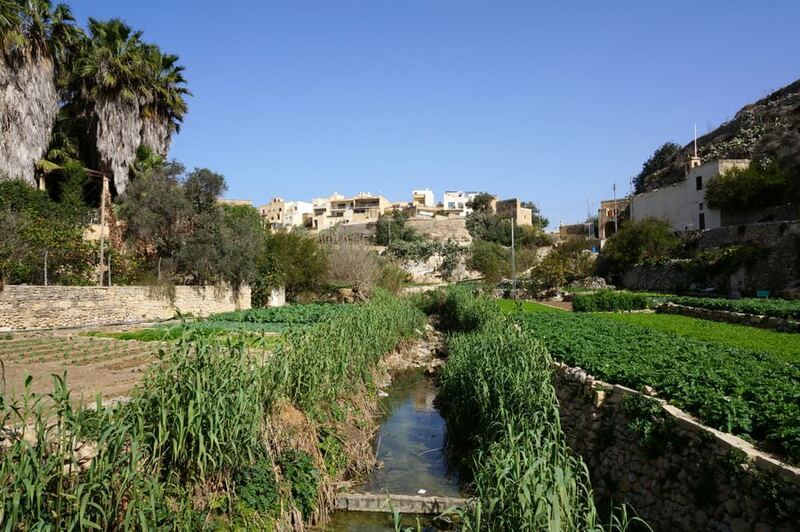 Fresh water and greenery are a rarity in Malta and Gozo! 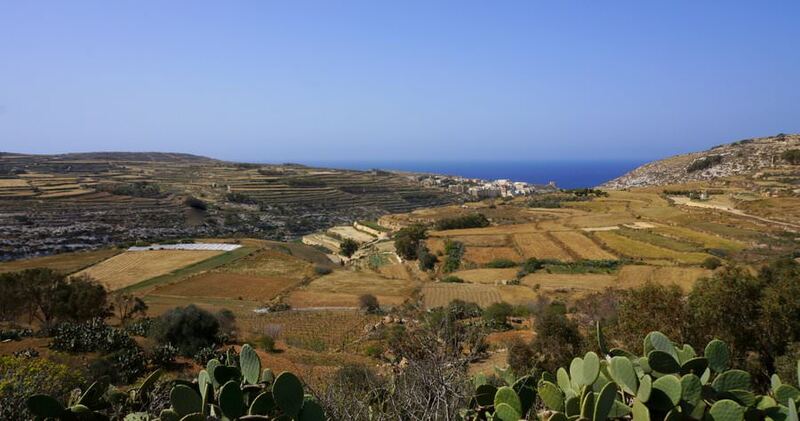 The trail meandered around the outskirts of Ta’ Kerċem with panoramic views over numerous crops and out to Xlendi Bay. We passed by farmers working in the fields, and small villages that felt like ghost towns. Finally, we arrived at Ta’ Sarraflu, a freshwater pond in the middle of (what felt like) the desert. The trees and vegetation here provided us with a little bit of shade, which was a welcomed relief. Luckily, we had our smart phone and the Google Maps app, so we were able to figure out which way to take when we arrived at junctions! The markings were spot on until we arrived at the limestone quarry, where they became few and far between, or non-existent. Regardless, we made it to our final destination: Fungus Rock and the Azure Window. Fungus Rock is huge. It sits at the mouth of Dwerja Bay, and the story goes that the plants (fungus) found on this rock had Viagra-like properties. People would trespass onto the rock and steal the fungus! So, the Knights set up a watch tower here to keep an eye on things, and protect their precious plants. During the summer months, or on a calm day, the swimming, snorkelling and scuba diving is excellent here. When we visited, however, it was extremely windy and definitely not a day for swimming. From the massive rock, we hiked over some crumbling limestone, and over a hill before the pièce de résistance was in sight. The Azure Window was as spectacular as we had imagined it would be. The gusting winds only added to the magic of the setting. We were surrounded by the sea, while standing on salt pans. Across from us was the towering natural rock formation, with waves crashing and spraying up on the arch. 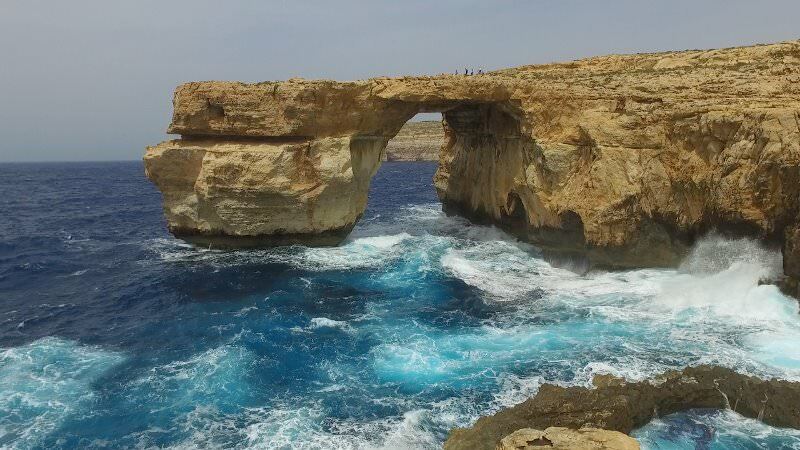 The Azure Window and the Blue Lagoon are probably the most famous and popular attractions in Malta and Gozo. A Game Of Thrones episode was filmed at the window as well, which is adding to its popularity. 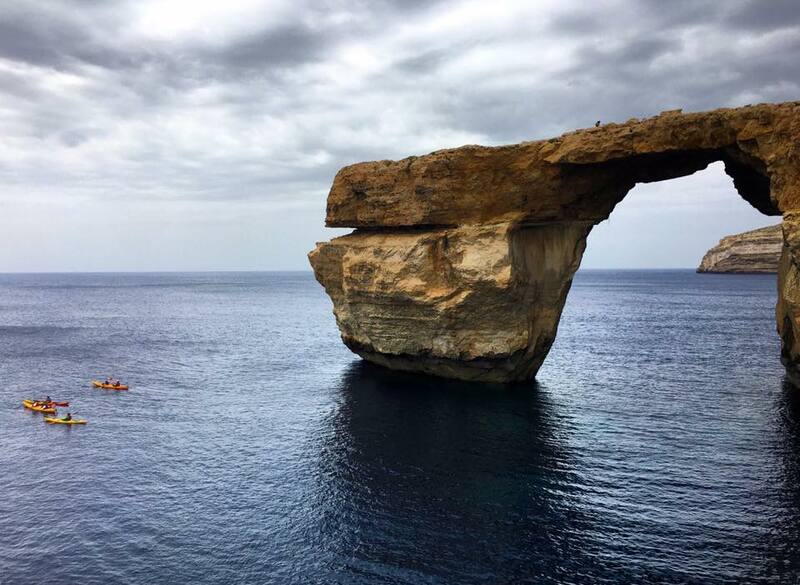 The Azure Window on a calmer day, with kayakers! After our 10km hike and our 14km paddle the day before (both in 30 degree heat! ), we were truly exhausted. We got on the local bus to take us back to our hotel in the village of Xewkija, where I finally was able to have a (much-needed) hot bath. 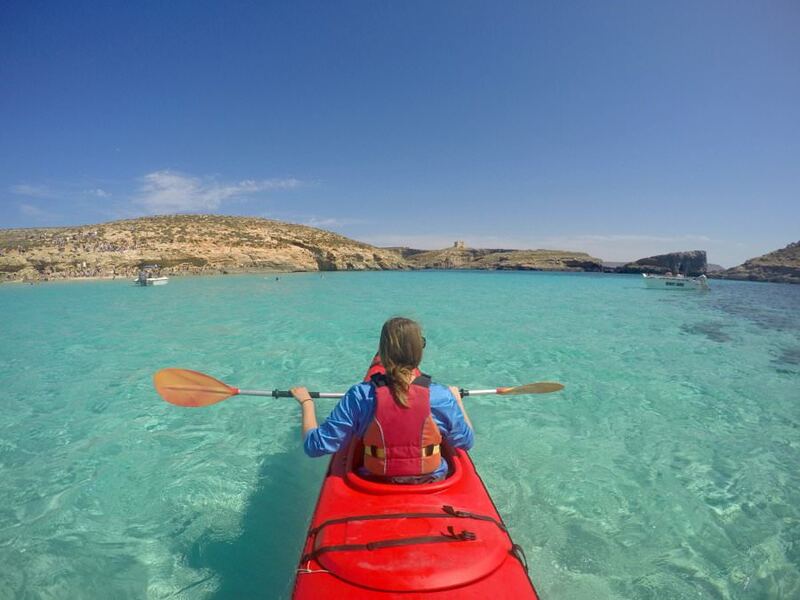 The adventures and activities on both Gozo and Malta are endless. 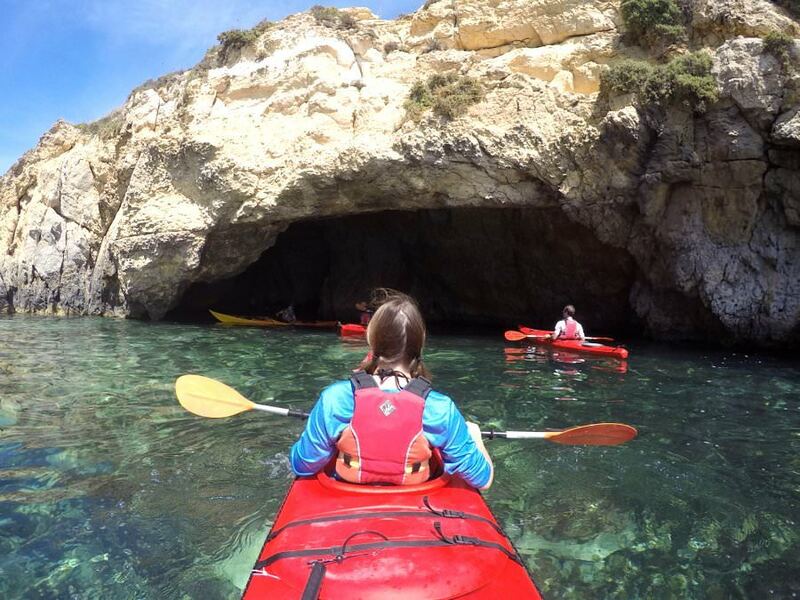 We loved biking, hiking and kayaking around the island of Gozo. If (when) we return, we would definitely try out the other hikes available, and would love to go on another paddling adventure with Sandra! If you have a smart phone, use the Google Maps app to find bus routes and schedules around the island. Also use the app for when you’re hiking, to make sure you’re staying on course. Check online to see the bus schedule for Malta and Gozo. Bus times can be off by 15 minutes or so. 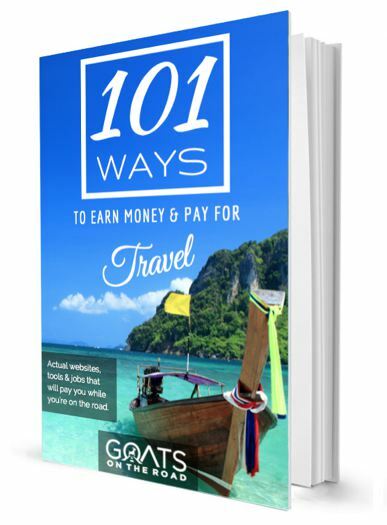 4 Days and up €7.00 / day. Many of the walks can be done on bike. If you want to have a fancy, but affordable dinner in Gozo, get the Malta Discount Card and head to Country Terrace Restaurant in Mgarr, near where the ferries land. This place has a spectacular view and the best food in Gozo, plus you get 50% off meals with the card. 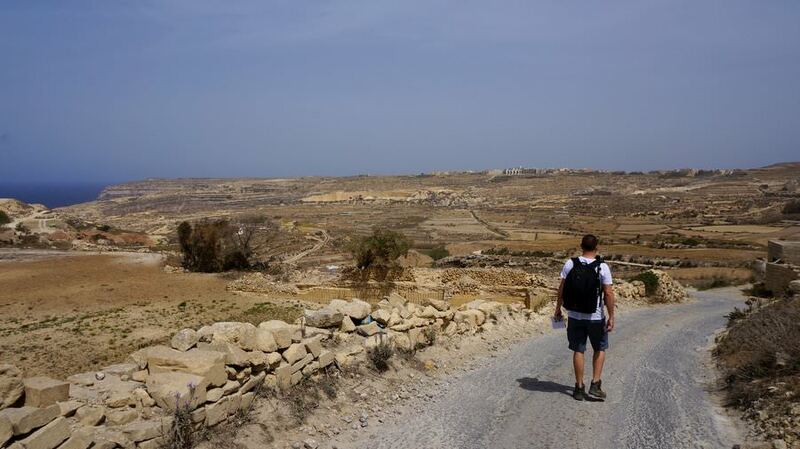 Whenever walking or cycling in Gozo and Malta, make sure you bring plenty of water, sunscreen and a hat as the semi-arid heat is a real killer. 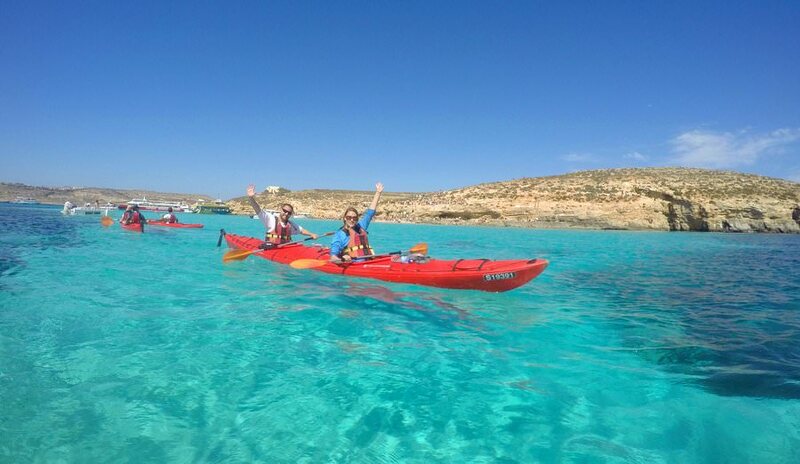 For a reputable kayaking company, contact Gozo Adventures. 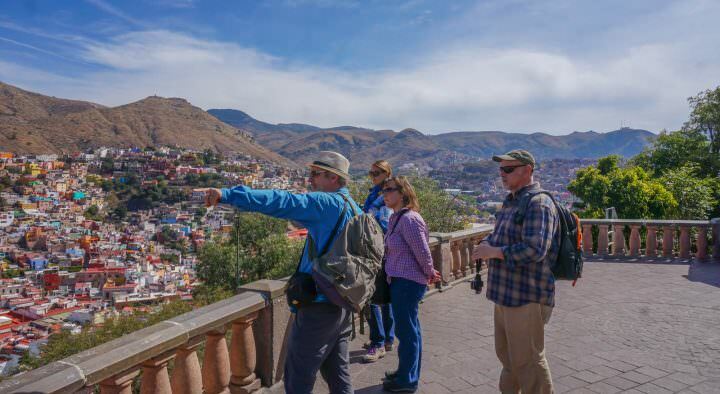 They offer full and 1/2 day trips, plus hiking, climbing, and biking tours. For scuba diving around the Azure Window, Inland Sea and more, contact St. Andrew’s Divers Cove – they were professional and the equipment was in excellent condition. Click here to see our video of the scuba diving around Gozo! 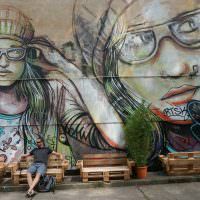 For a great hotel in a non-touristy area (but just 10 minutes to Victoria), check out the new Quaint Boutique Hotel in Xewkija (rooms from €70 / $79). We loved it! 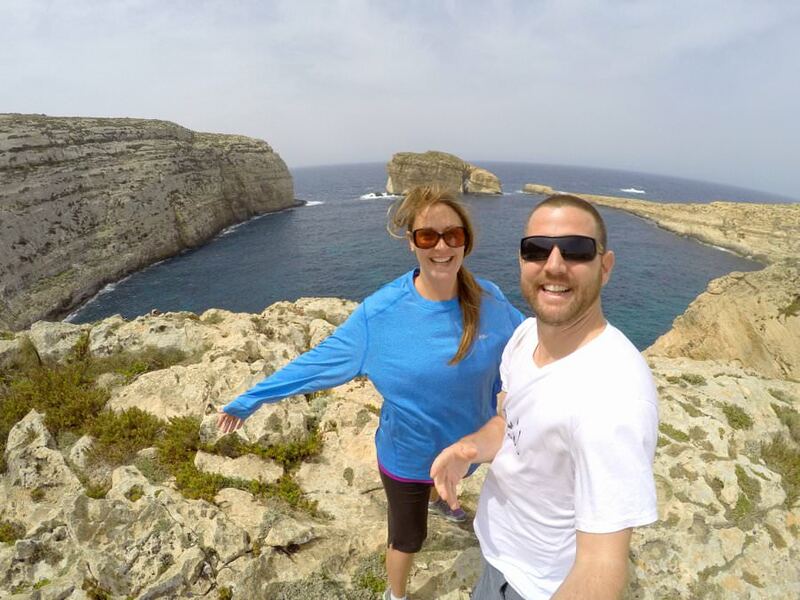 Check out our 3 Videos from Gozo! You seems to love scuba diving, you should try, if you come back, to dive in Comino. There are a lot of really beautiful spots and cave to visit with beautiful wildlife and wrecks.